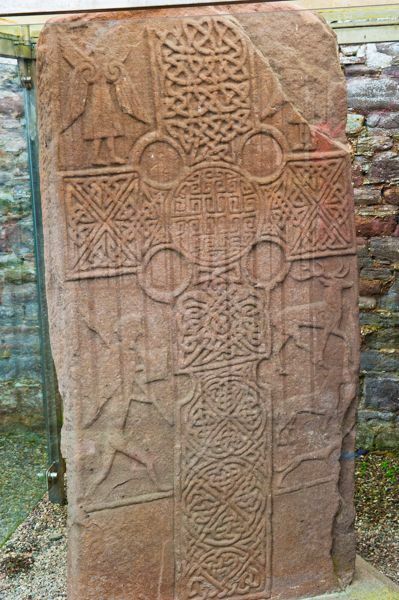 A richly carved Pictish stone stands in the churchyard beside the ruined kirk of Eassie, 2 miles west of Glamis Castle. 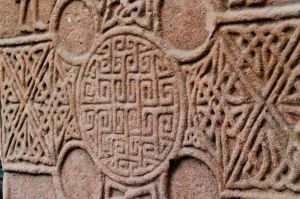 The sculptured stone dates to the 8th century and is best described as a cross-slab. 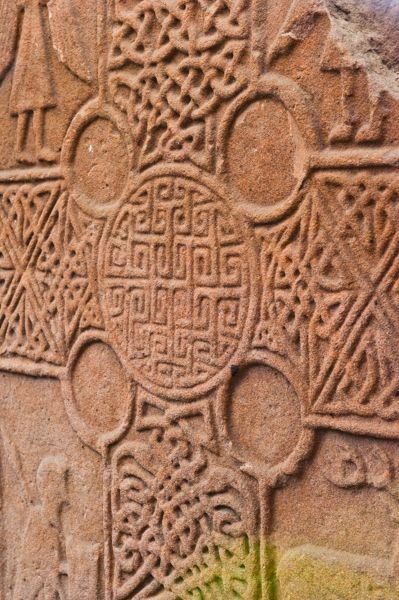 One face of the stone is badly worn, but the other displays elaborate carvings set around an incised cross. 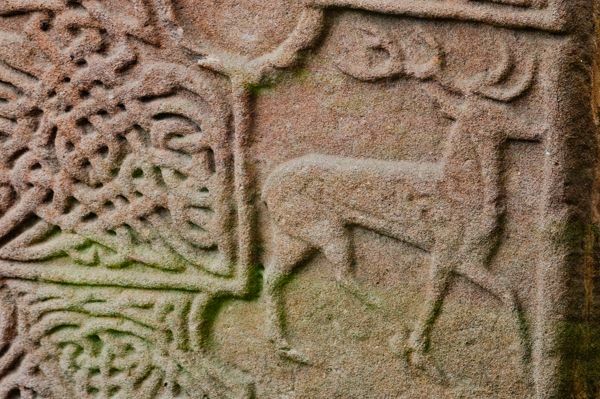 These carvings are in a very good state of preservation and show the wonderfully intricate patterns and lively expression we associate with the best of Pictish art. 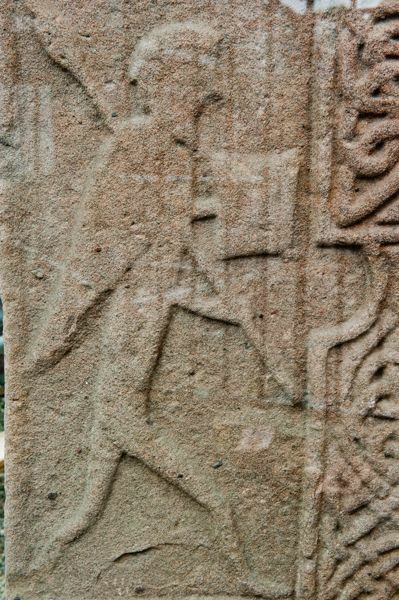 There are likenesses of several figures, including angels (or, as some sources interpret it, cloaked warriors carrying staffs), along with a stag, a tree, a hunting scene, and other common Pictish symbols such as a Z-rod, double-disc, and a Pictish beast. One area of the cross shows three cattle, one with a bell around its neck. 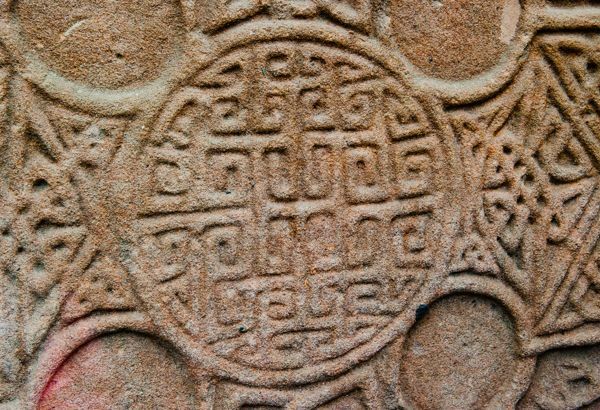 The quality of the carving is exceptional, particularly the intricate Celtic interleave patterns. 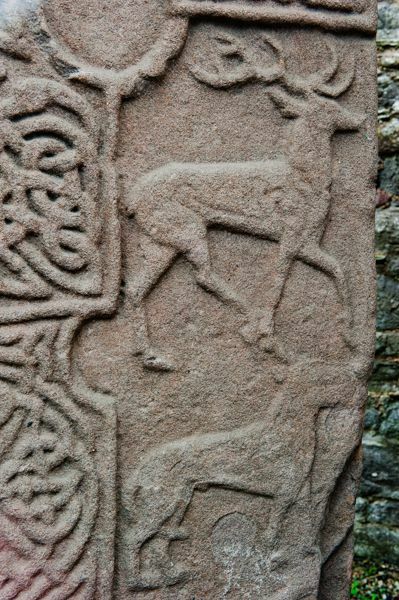 What is so fascinating is the combination of Christian symbols with traditional Pictish symbols and secular scenes like hunting. The cross slab is just over 2 metres high and 1 metre wide, tapering towards the top. 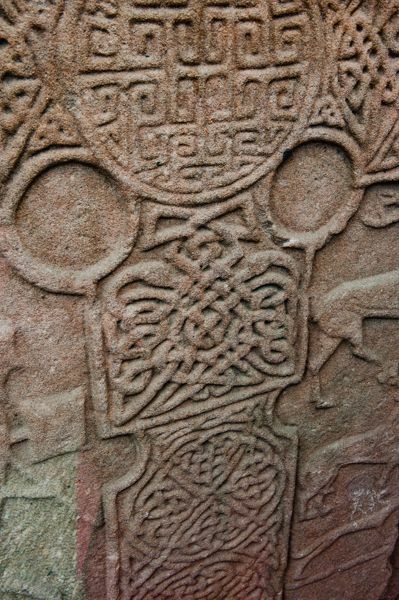 It forms part of what is termed the Aberlemno School of Pictish sculpture and is labelled a Class II stone. 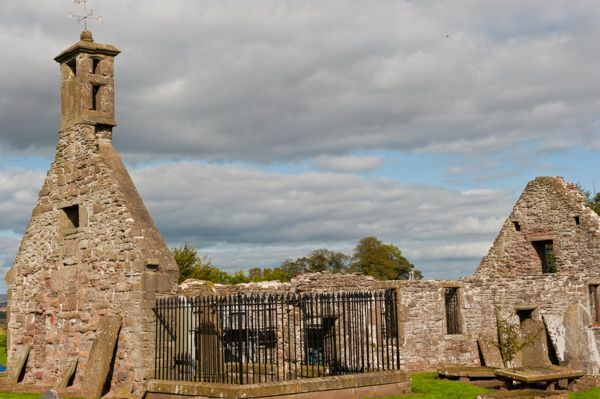 Other examples of stones by the Aberlemno School include those at Aberlemno, Glamis, Rossie Priory, Kirriemuir, and Monifieth. The stone was found in the nearby burn in 1786 by Rev. Cordiner and rescued from its watery resting place to stand in the yard outside the 16th-century church. It was later moved into the roofless church and now stands inside a protective plexiglass case. Though the case does protect the stone from weathering, it also, rather unfortunately, means that there it can be difficult to make out some of the carving details due to reflected glare off the glass. Location: In the churchyard in Eassie village, off the A94, 2 miles west of Glamis. 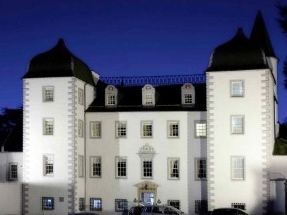 The nearest postcode is DD8 1SE.